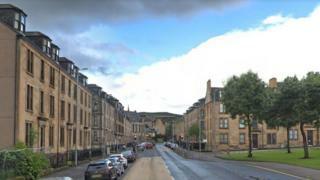 A man has died after being found with serious injuries at a flat in Inverclyde. Emergency services were called to reports a man was seriously hurt at a property in Nelson Street, Greenock at about 05:45 on Sunday. He was pronounced dead at the scene. Police are now investigating and are treating the death as "unexplained". A post-mortem examination will take place to establish the exact circumstances of the incident. Police said the inquiry was at an early stage and that a report would be sent to the procurator fiscal.